Have you heard about The Inside-Out Revolution? It’s awesome! Today you will hear many people say that all you need to do is think positively and everything will be ok, you’ll be happier. This does help, up to a certain point. There are many books available that discuss this, and their theory behind it is to live in the present moment. This is true, however I always felt that there was a missing piece, a key per se, which goes a step further in explaining how to do this. 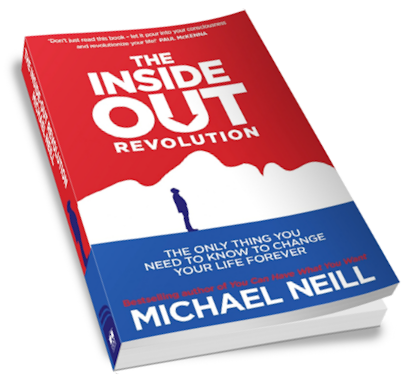 I found this book, The Inside-Out Revolution by Michael Neil to be an easy read and I was able to read this in less than one day while travelling. The author’s writing style in very simple to understand and the concepts are easy. The book was built on the works of Syd Banks and George Pransky and is about mind, thought and consciousness which is believed to be the path to understanding how life works and to being liberated and happy. I must admit that a few times in the beginning, the first 20 pages or so, I was tempted to stop reading as I felt that the author was rambling a bit, talking about how easy it is to implement this new way of thought but was not actually revealing how to reach this state. What kept me going was the fact that he actually kept stating to not give up, and give the book a chance. What was shocking to me was that while reading this book, I had a huge epiphany when I read on page 31 “we’re living in the feeling of our thinking, not the feeling of the world.” I read it in just the nick of time and was able to side step a huge and impactful mistake which would have caused some serious consequences. I realized right then that I WAS indeed living in my feeling of my thinking. I was assuming that people were miserable and needed saving, when in fact, they were happy and content and didn’t need my help at all. It was ME that was miserable. When I understood this I was able to let go of my preconceived notions and sit back and enjoy life. This lesson alone made reading the book worthwhile. Although it seems that the concepts of awareness are simple and easy to do, they are impactful. I am pleased that the author includes a section for further reading. I also like the fact that, even though the book is short and simple, at the end of each chapter the author summarizes the points of that chapter. I found this book to be profound. I highly recommend this book. FTC Disclosure: I received this book for free from Hay House Publishing for this review. The opinions expressed in this review are unbiased and reflect my honest judgement of the product. 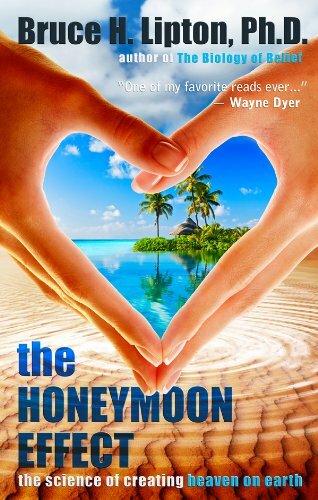 The Honeymoon Effect – Is it really possible? “The Honeymoon Effect: A state of bliss, passion, energy, and health resulting from a huge love. Your life is so beautiful that you can’t wait to get up to start a new day and thank the Universe that you are alive.” – The Honeymoon Effect – the science of creating heaven on earth. Is it possible to create heaven on earth? I pondered this many times, especially when I was at a low point in my life. But apparently it is possible. My first exposure to Bruce Lipton was during the Hay House “I Can Do It” Conference in Toronto this past July where he lectured on The Honeymoon Effect – the science of creating heaven on earth. I was curious to learn about it and I was completely astounded by the information which was shared. I was then very happy to receive this book by which the lecture was based on for free from Hay House Publishing for review purposes and the follow review is unbiased and reflects my honest judgement of this book. Firstly, I must say that I wish I had come across this book many, many years ago as it would have saved me a tonne of grief and heart ache. The book talks about the law of attraction and how it affects a relationship, but takes it a step further than all the other books out there that attempt to explain the same. Most books preach that what you put out there is what you get, but fail to explain how this phenomenon takes place and the mechanics behind it – quantum physics. Although the book is scientific, it is very easy to read. It is written for the average person and contains humor as well, which is refreshing as scientific concepts can be very dull and dry. Bruce has a talent for telling and incorporating relevant and entertaining stories to support his theory. Lipton does really well in explaining how all the subconscious gunk which we collect while growing up, the programing we are subjected to, affects all the decisions we make, and how we bring them into our relationships with other people, and how we look for them to complete us, and therefore are never satisfied. He then goes on to state that “bad” vibes have the opposite effect and can be very destructive, and “may be your nervous system’s warning that you’re hanging out with the wrong person. An energetically disharmonious relationship likely features shouting matches and recriminations – even being in the same room with your partner depresses you.” I found it absolutely fascinating learning about the science behind this, and also the depth to which he goes into. As I mentioned previously, I wish I had read this book long time ago, such as 15 years ago, as it would have saved me a lot of pain and grief which I experienced in many of my relationships. However, since I can’t go back in time and fix those relationships, I am certainly keeping this knowledge in tow and using the skills and tools learned with my present day relationships. I recommend this book to anyone who is in a relationship – romantic or not.